Every belief resonated with me. Keep the great content coming!!! I am looking to get started in wholesaling and use these podcast to help educate and give me the confidence I need. Keep doing what you guys do!! Thank you! Thank you for sharing such great content and I am so glad I randomly stumbled upon your podcast show! Canât wait for the next episode to drop! Value packed. Attention keeping. Encouraging. Challenging. You guys are amazing. I love how genuine and knowledgeable you all are. Not to mention humble ! Not sure where I would be without this podcast! Thank you all for delivering much needed tools to help in wholesaling. Love these guys. Iâve learned so much from them. They are so enthusiastic about real estate. Great job guys and thank you!! I love this podcasts! It really motivate me to take action. I listen to it at work and it really makes me want to quit my job and take massive action. Tom is a GOAT! I listen to this podcast EVERY single day!..... at home. At work (Bluetooth earpiece) All day EVERYDAY! It is the most DETAILED podcast on Wholesaling that I have ever heard. I am âADDICTED!â I love it! I listen to some episode 4 or 5 times! I listen to EACH episode at LEAST twice! I love the energy on there podcasts!! BAMM!! These guys are true go givers, they drop so many gold nuggets for us to implement immediately in our wholesaling journey. Although I have not done a deal yet, i have definitely gained some insight on what to do and what not to do, when trying to wholesale real estate. And lastly the energy that Tom, Cody, and Brent provide. Makes the podcasts even better. It keeps me engaged and awake while I am listening. Thanks guys. I listen to this everyday! Canât wait to become a rhino! I want this guys energy. I only listen to one podcast, this one is it. Thank you Tom, Cody and Brent!! We are all meant for greatness! Itâs how God designed us!!! I firmly believe that if Real Estate is your chosen avenue to pursue greatness and to make an impact on peoples lives, the wholesaling inc/investor grit team is the best in the business to get you there! Subscribe to this podcast and I promise you wonât be disappointed! Once you do, you will find yourself wanting more...then itâs simple, join the Tribe and find out just how amazing this team is! Greatness awaits!!!! Iâm not yet a member of the Tribe but am definitely considering it. Tom and Cody are awesome podcast hosts and very motivating. Each episode is filled with some actionable advice. Iâm looking forward to implementing more steps and closing some deals! Stop Learning and just Start Earning! When you're excited about real estate investing and you're new, it's very easy to subscribe to every podcast, go to every forum, and try to learn every technique. Wholesaling Inc takes a different approach: laser focus on one technique. The result is that you will have phenomenal success very quickly, instead of struggling to try and do 30 things at once.I was a guest on the podcast due to my success, but I wasn't actually a member of the coaching program at the time. I simply took the ideas and strategies that were shared on this very podcast, and did about 50k+ in deals on my own. Tom Krol then invited me to join the tribe and make a large donation to a charity instead of paying my way in.Tom and Cody are two of the most genuine, caring, helpful, go-givers I've ever met, and their personality and excitement shine through in this podcast. So thankful for this podcast! Iâm a landlord now a wholesaler, Iâve become obsessed with wholesaling Iâm so thankful for this podcast! It gives me my wholesaling fix! I love the crew! Iâm a TTP member!! If youâre looking to get into real estate wholesaling or already in it, this podcast will help you step up your game. I love the practical advice, the marketing ideas, and the success stories from people who have been there and done that. Very motivating and gives a call to action. Thanks! No bluff no BS. Besides being very knowledgeable in the wholesaling business Tom and Cody go the extra mile to show step by step how to get into wholesaling. I love it! These guys are very diversified in their knowledge of Real estate from marketing to closing deals. They should honestly charge for this information thatâs how valuable it is! They also have an amazing diverse group of people who come on as guests from all walks of life from all different kinds of situations who turned out to be very successful on all different kinds of levels and experience. If you have doubts at all about reaching your personal and financial goals through Real estate just listen and youâll realize literally ANYONE in ANY situation can do this and that the only thing keeping you from reaching your goals and dreams is you. Go listen and do something your future self will thank you for! Not impressed only listened to one podcast and it gave no information besides his training program site. New to wholesale real estate investor. Iâm brand new to wholesale real estate investing, and ingesting as much information and education as I possibly can. 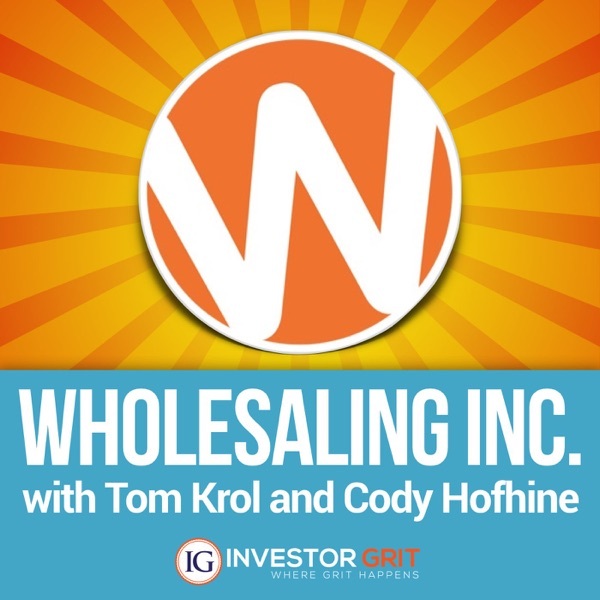 The wholesaling Inc. podcast is by far the most informative and energizing podcast or source of any information that I found to date. The energy bus the hosts and the interviewees bring is contagious and the real world experience of how people are getting things done starting out and growing their business is unparalleled. Love these guys and what they do for the industry. I came from a Real Estate background and started listening to these guys the Summer of 2017. I implement the instruction they provide and Iâm finding much success from it. If I can do it, anyone can do it!! Hello Podcast Listeners! I've got to say that this is and will continue being one of my favorite podcast to listen to. The information and stories on here are not only helpful in terms of knowledge gained but inspirational as well! They have sparked my interest into Real Estate Investing and have even given me heart warming anecdotes that I will carry with me throughout my journey. I highly recommend you subscribe to this channel and if it's as helpful to you as it's been to me. Leave them a review! These individuals are changing lives. Tom is a nice guy who wants success for all. I get a motivation jolt every time I listen to one of these episodes. Unbelievable. Beyond great. Too many people in this industry do not understand how to help people and give them the tools necessary to succeed. real estate is an action sport and WHOLESALING Inc know it. Great podcast with in-depth analysis of wholesale deals. I have been listening to this podcast and itâs GOLD. It has tips, tricks, and practical advise tailored to Wholesaling. I highly recommended it. Best free massive steps to take you from just living for a paycheck to giving and living like youâve dreamed!! Just one bit of advice Iâve learned from every podcast for too long: you cannot just listen and mentally take in some of it with a âto do laterâ attitude. Without the action this podcast is like a treasure chest right behind your house with no key!If you really want to dive in and get success from step by step instruction literally from Tom and Cody- Sign up for a call to join the tribe and take massive imperfect action! This podcast is a great way to get motivated and inspired to take some action in wholesaling. While I haven't joined their tribe, I have taken a lot of the information and started to mail lists in my town to begin wholesaling. Tom and everyone on the podcast are great to listen to and break things down to a really basic level to help you take, as they say, massive imperfect action. I love the energy, the attitude and drive these guys have! They focus a lot on giving and doing things the right way. You donât hear that often in business and itâs super important. Thanks guys! A podcast that tells you all the little details of the business and this overall niche of real estate investing. They're honest, fun, and SO uplifting. I love the energy and direct teaching strategies given on this podcast. I love that episodes are short and focused just on Wholesaling. Awesome! Just addicted to this podcast. Thank you for all of the valuable information. Listening to these interviews truly makes me feel more confident that I can go out and do the same. Great podcast with tons of useful information. Iâve been a realtor and investor for many years and I always learn something new. The wholesaling stories are very inspiring! Love it! This podcast inspires me. The guests and hosts are very open about the steps they have taken to achieve their success. I am constantly reminded that it is not the grand things that lead to success, but rather the consistent daily tasks that leads there. Brent Daniels - king of cold calling- talks about deliberate practice, and how this leads to success. Great podcast! I look forward to this podcast every week and love the content! Applied knowledge is the best! If you canât afford the program listen to what the Podcasts say because I give you clear and cut instructions on what to do itâs up to you take action on it! Been listening to these guys for about a month now. Authentic stuff! Absolutely powerful lessons full of practical advice for everyone interested in Wholesaling in all levels of experience. This podcast guys, is everything! This podcast has become my companion while running. Itâs the most down to earth, applicable and valuable information Iâve found so far that helps me stay focused on and in the growth of my business. Great stuff! Easily one of the best real estate podcasts out there today. Chocked full of great information and they really dissect each deal and spit back the info so anyone can understand it. I've listened to every episode and many of them more than once. I found Tom years ago on his brother Todd Tobacks Podcast. In a couple of years this guy has created a wholesaling EMPIRE and Im totally not surprised. He just "get's it" where most people miss it. Listen to a few episodes, I dare you. You'll not only hear a very passionate guy, you'll hear a man who really cares about people. And THAT RIGHT THERE is his key to success. Imagine that, caring about people. No matter how down or discouraged you are, this podcast with the success stories is awe-inspiring! This podcast gets my heart pounding with excitement to go lock up deals. There is so much âsecret sauceâ in these shows. Thanks, guys! All the information in this podcast is not only motivational, but incredibly informative. Simple instruction paired with the drive to succeed will put you in a situation like never before.I couldnât recommend this podcast enough! Tom, Cody and Brent are simply awesome!!!! Love listening to the podcast because it refreshes my memory about what to do and who to call to get deals done. Love tom and cody. No fluff, actionable steps to get straight to producing revenue! Listening to Toms podcast and Cody didnât only get me started but helped me to stay in the business when times got hard and it would have been easy to quit. I recommend Tom and our tribe to everyone wanting to know more. This is the real deal!Thanks for everything!